Start with a few leftovers, add a couple of new recipe discoveries and have a good time Mexican-style with a couple of tweaks by the Gringo Gourmet. 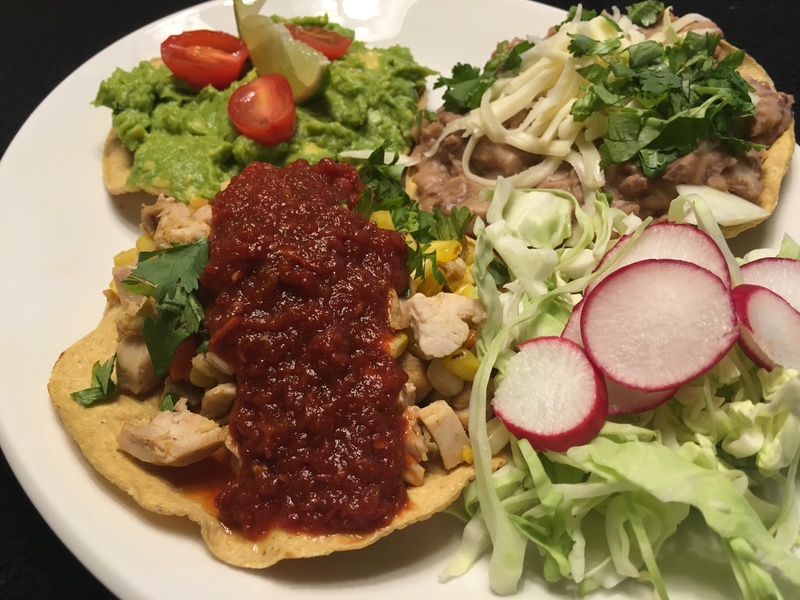 Tostadas compuestas – guacamole, pinto bean and chicken topped with Watermelon – Ancho Chile Salsa and cabbage radish on the side. I frequently order tostadas compuestas at Mexican restaurants because they are about the lightest thing on the menu. You usually are served three, one with beef or chicken, one with refried beans and on topped with guacamole. I consider the guacamole tostada a dessert and save it for last. I wanted a quick and easy dinner, so I rummaged through the refrigerator and pantry. In the refrigerator, I found leftover chicken from chicken tacos a few days ago, some grilled corn and a dab of pinto beans. On the counter I had part of a package of pre-cooked flat tortillas for making tostadas compuestas. I was on my way. I added a sweet pepper and some diced onion to the chopped chicken and one topping was done. I spooned the leftover beans into a small pot and heated them. Then I added about a tablespoon of milk and some grated Jack cheese and worked all over with a potato masher making unfried refried beans for tostada number two. Then guacamole, with a little chopped onion and garlic salt, mashed by hand so it had some small chunks in it. There was a wonderful restaurant called Sylvano’s where Albuquere’s tangled spaghetti bowl of freeways is now. I loved their blue corn enchiladas and could have become addicted to their guacamole. One evening sat where I could peek into the kitchen as the servers brought out platter after plater of wonderful food. In the background, I watch a granny-looking woman bent over a huge bowl, mixing that wonderful guacamole with her bare hands. She had guacamole almost up to her elbows. I didn’t share that vision with my table mates. They would have cringed at the sight. I sometimes use my hands and fingers to mash the avocados just like that beautiful old lady did. I hope that gives mine something close to the wonderful authentic handmade flavor of hers. In the picture above, you see my plated tostadas. I served shredded cabbage on the side so the three tostadas wouldn’t be hidden. The dark red salsa on the chicken tostada is from a recipe I recently discovered. It is a no-cook Watermelon-Ancho Chile Salsa that has a little heat and a little watermelon sweetness in its rich flavor. It is excellent on chicken and I have enough left to try it on a roasted pork tenderloin this weekend. When I made chicken tacos earlier in the week, I added a side of Shrimp Ceviche. I had some leftover, so we polished it off with the meal of tostadas. I love ceviche and sometimes treat myself to a pair of shrimp ceviche and small shrimp cocktail for lunch on a hot day at Sofi’s Mexican Restaurant. We use different recipes, but both are very good. Traditionally, ceviche, made with firm-fleshed fish or shrimp, is marinated in lime juice to “cook” the fish. Most modern recipes suggest blanching the fish or shrimp for about three minutes, then draining it and letting it cool. I’ve made it both ways with no ill results. I do blanch it if I’m serving it to guests. I expect that most restaurants poach their for safety reasons. 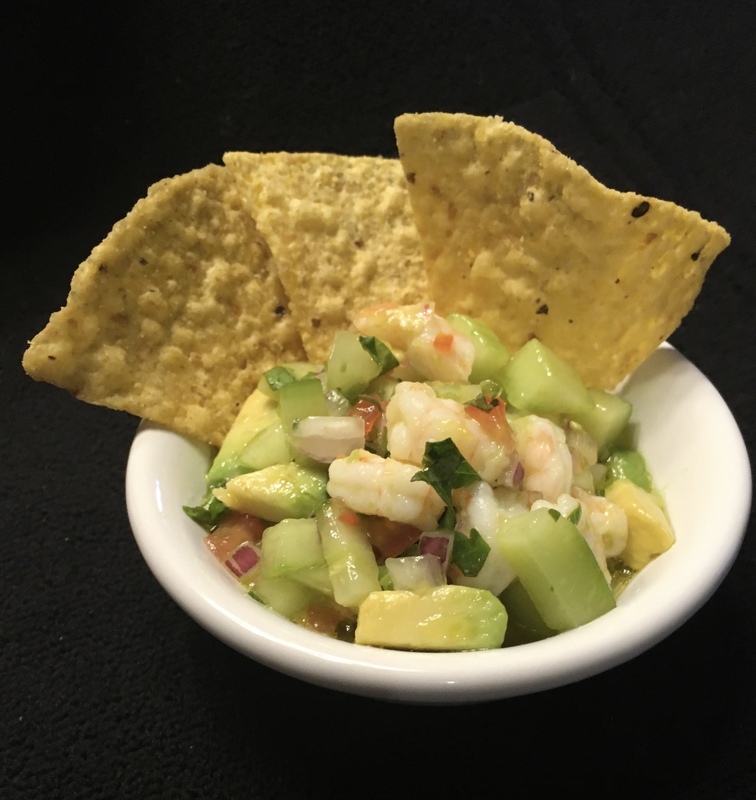 Homemade shrimp ceviche and tostadas – appetizer, side dish or main course – your choice. It is more than worth all the chopping prep. Transfer chiles to a blender with a slotted spoon, discard liquid. Add watermelon, tomato, onion, jalapeño, garlic and lime juice, blend until smooth. Season with salt, cover and chill. shrimp and immediately turn off the heat. Let the shrimp sit until just cooked through, about 3 minutes. Transfer to a cutting board until cool enough to handle, about 10 minutes. Chop the shrimp into 1/2-inch pieces and place in a medium nonreactive bowl (see Tip). Add lemon, lime and orange juice. Stir in cucumber, onion and chiles. Refrigerate for 1 hour. Stir tomato, avocado, chopped cilantro, oil and 1/4 teaspoon salt into the shrimp mixture. Let stand at room temperature for 30 minutes before serving. Garnish with cilantro leaves, if desired. Make Ahead Tip: Prepare through Step 2 and refrigerate for up to 4 hours. Kitchen Tip: A nonreactive bowl or pan—stainless-steel, enamel-coated or glass—is necessary when cooking with acidic foods, such as lemon, to prevent the food from reacting with the pan. Reactive pans, such as aluminum and cast-iron, can impart an off color and/or off flavor. I read about steamed eggs and got curious. One recipe was for blending eggs and a little water, putting then mix in a small pan, covering it and placing the pan in a larger one and steaming it in the oven. The result was a fluffy, puffy egg that, because of the size of the pan, was just the right size for sandwich. Interesting, but I haven’t tried it yet. What I did try was cooking eggs in a steamer basket over a half inch of water. Add water to a sauce pan, place eggs in a steamer basket, bring water to a boil, reduce heat to a simmer, cover the pan and steam for about seven minutes. Remove the eggs to an ice water bath. When cool enough to handle, peel them. The result is tender white and a silky smooth yolk. I discovered that it takes practice. The first time I steamed eggs, the ones I was peeling remained in the ice bath. As the eggs cooled off, the membrane around the white glued the shell and white together making it almost impossible to peel the egg without tearing chunks out of the white. I was really disappointed by this. The eggs were delicious, but ugly. And the ones that had stayed the longest in the ice bath were really chilled through. This was not what I had hoped for. Egg whites torn in peeling are lot the look I’d hoped for. It was time to get busy in the Gringo Gourmet Academy Test Kitchen and figure out how to make this work. The taste is so good! I wanted the appearance to be just as good. A couple of days later, I wanted an egg garnish on avocado toasts, so I made hard boiled eggs. Again, I put the cooked eggs in an ice bath to prevent the gray ring around the yolk that sometimes happens. Again, the eggs were hard to peel after the ice bath. I tried a YouTube video inspired peeling method that worked pretty well. It was very entertaining. Chip away some peel at both ends of the egg, place it to you lips and blow very hard. The boiled egg pops out of the shell into your hand. It was fun to do this with a couple of eggs but I think it is a technique I will save for Easter eggs after the hunt. The youngsters will get a kick out of watching and trying it. This morning, a Sunday, I gave it another go. I steamed the eggs, and this time plunged them in the ice bath and immediately took them out. They were much easier to peel while still a little warm. As they cooled, it became a little more challenging. I tried blowing one. The soft white and yolk didn’t stand up to the blow and I had to clean up the countertop and backsplash. I did have to laugh about it. I served the virtually empty and deflated egg white to a friend and told him it was a low cholesterol egg since he takes a cholesterol medication. My last peeling attempt was to crack the shell on the side and remove enough to allow me to slip a soupspoon between the egg and shell. Carefully I worked the spoon around the egg and was able to remove it easily and neatly. A little of that adhesive membrane remained on the shell, but none was on the egg. I was greatly relieved that I had smooth eggs to plate this morning. 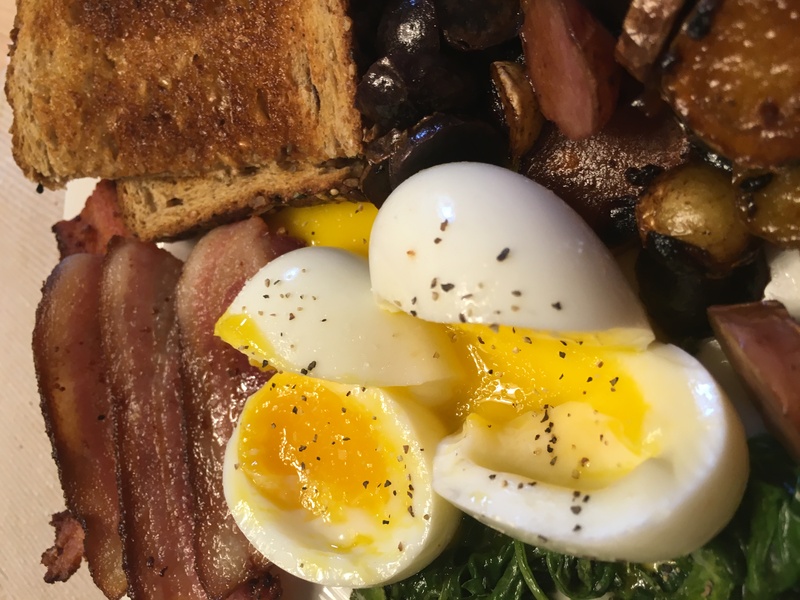 While the eggs were steaming and peeling was going on, I cooked a few strips of thick-sliced bacon and placed them on paper towels to drain. After removing most of the bacon drippings, I sautéed some chopped onion and coins of tiny fingerling potatoes. The potatoes were a mix of blue, red skinned and white skinned potatoes. I had used most of the white skinned ones the first time I steamed the eggs. This time, I had more blue and red potatoes than white, so the presentation potatoes were dark. I removed the potatoes from the pan and dumped in the remains of a box of mixed spinach and arugula leaves to add a little flavor and color to the plate. 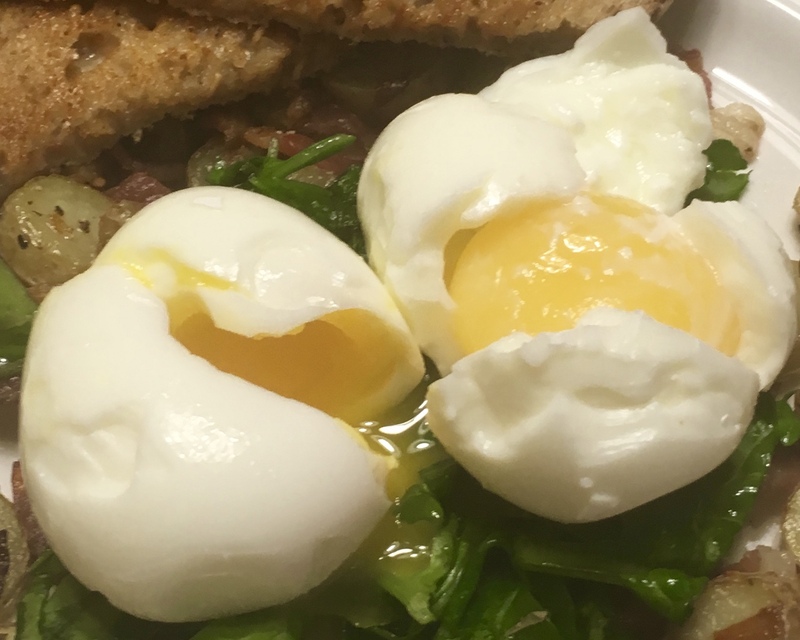 A slice of multigrain toast was included to sop up the silky egg yolk. What a difference a smooth white makes on the plate over a pitted one! Sunday breakfast bliss. 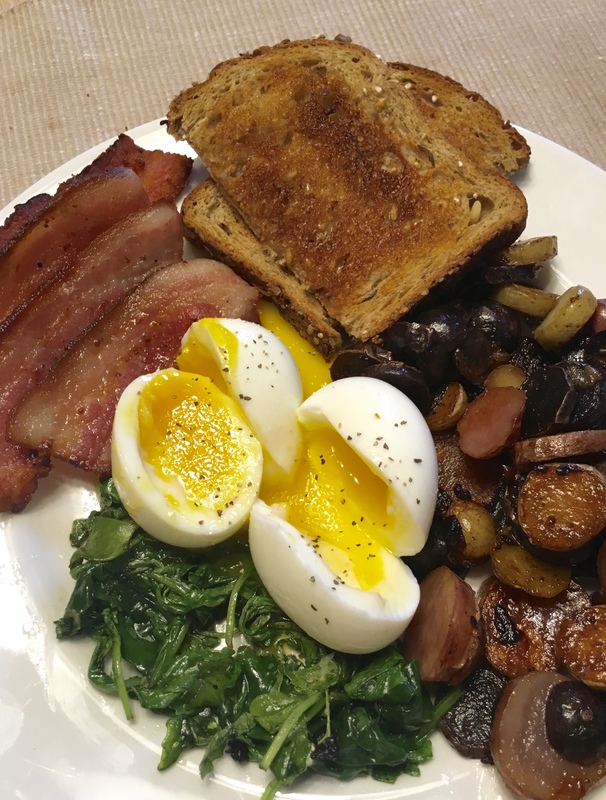 Steamed eggs on wilted greens, bacon, sautéed fingerling potato coins and toast to soak up silky egg white. Cold or hot? Yes, it is. And crunchy, too! Watermelon, and jicama and jalapeñ0? Why not? And brightest all with lime juice and come chopped cilantro. One jalapeño or serrano chile, thinly sliced, seeds removed. 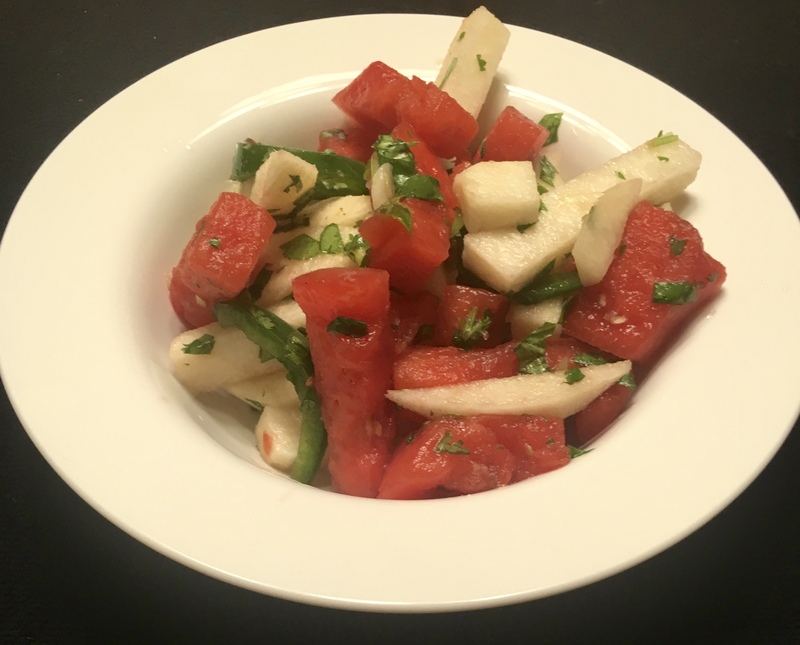 In a large bowl, toss together watermelon, jicama, jalapeño, scallion, cilantro and lime juice. Season generously with salt. Gently toss in watermelon. Serve chilled. With summer vegetables at their peak, I’ve been seeing a lot of ideas for salads and garden vegetables online and in the magazines. Some just beg to be tried. I’ve always loved an old-fashioned wedge salad – an iceberg lettuce wedge topped with bleu cheese dressing and crumbles and maybe some crisp crumbled bacon. When I found a wedge salad made with either savoy cabbage or napa cabbage, I was on my way to the produce aisle! The interesting thing about this salad, is that the cabbage wedge is grilled to tenderize it and add a little smoky char. It only takes a couple of minutes to get some grill marks on the cabbage and you don’t want to burn it so do pay attention! 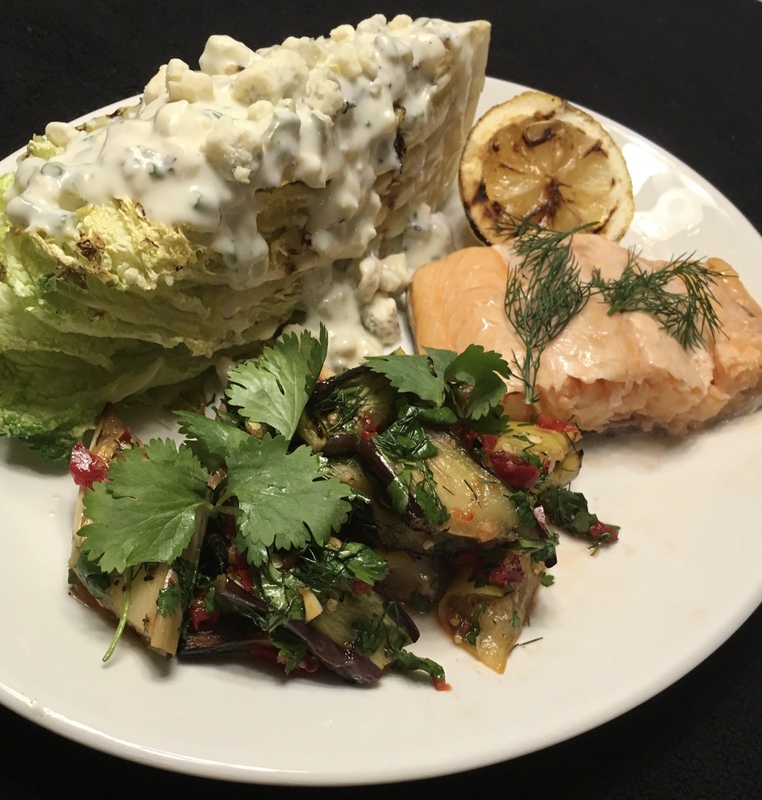 Grilled Nappa cabbage wedge with bleu cheese dressing and crumbles, salmon with grilled lemons and grilled eggplant. Summer supper outside the kitchen. I found a recipe for grilled eggplant with a fresh hot sauce that I’ve used as a side dish. It’s the eggplant in the above photo. 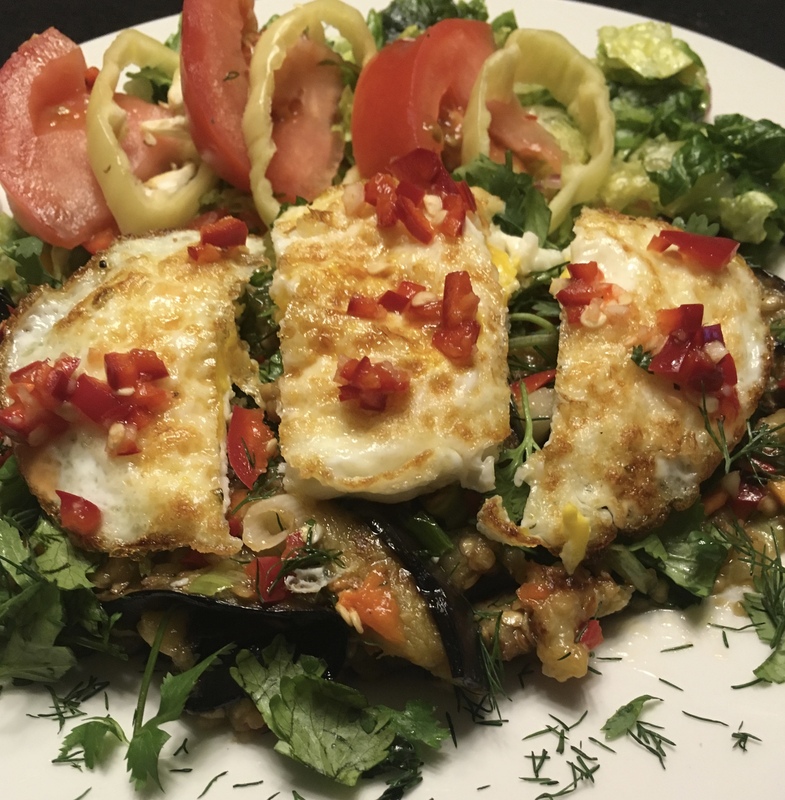 The original recipe featured “crispy eggs” on top of the eggplant which made it a vegetarian meal. I’ve included the recipe for the sauce below and a photo of the vegetarian meal. Fresh Hot Sauce – This simple fresh hot sauce is great on squash and eggplant. Toss chiles,garlic and a large pinch of salt in a small bowl. Let sit until softened – 8 – 10 minutes. Stir vinegar and honey into the sauce. Grilled Asian eggplant are drizzled with olive oil and turned until lightly charred and tender. Slice the eggplant and toss with chopped scallions, chopped cilantro and dill. Toss with about half the hot sauce. Transfer to a platter and top with sliced hard-fried egg that is a little crispy on the edges and drizzle with remaining hot sauce. Garnish with cilantro and trill if desired. Grilled eggplant with crispy fried egg and fresh hot sauce. served on a bed of greens with sliced tomato and pickled chablis peppers. I love this hot sauce and it comes together quickly. FYI, Fresno peppers are bright red and pointed. They are sometimes called red jalapeños but they are a different pepper. They have a little bite, but not the heat of jalapeños. 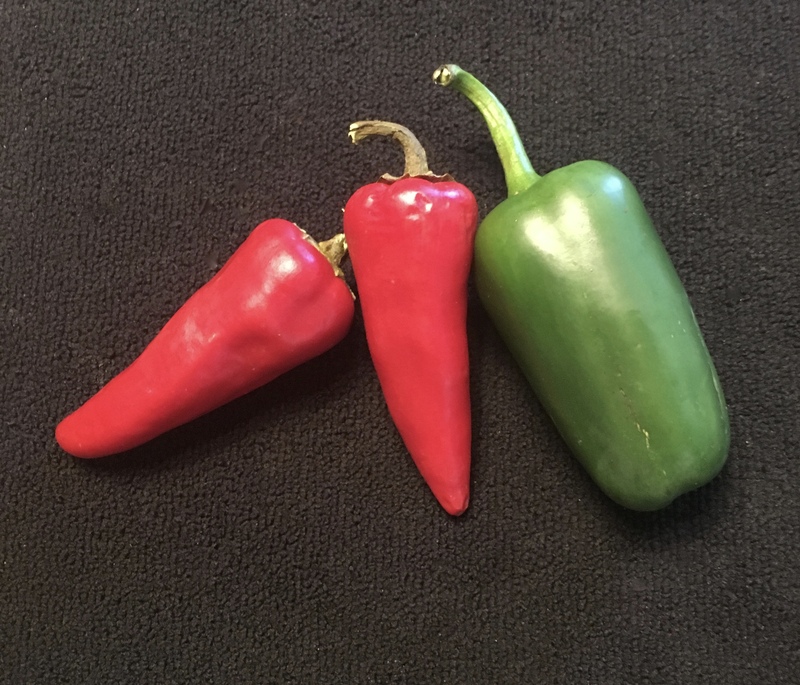 Fresno peppers on the left; a jalapeño on the right. Even though jalapeños turn red if left to ripen, they are not the same as the Fresnos.